SAULT STE. MARIE, Ont. 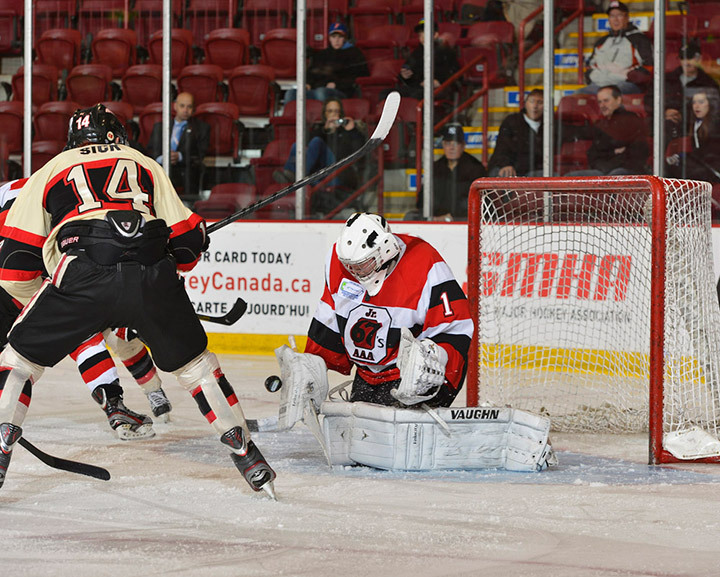 – Ryan Kuffner scored on a power play early in the third period and Simon Hofley made 55 saves as the Ottawa Jr. 67’s kept their semifinal hopes alive at the 2013 TELUS Cup thanks to a 2-2 tie with the Red Deer Chiefs on Friday morning. The single point for the Chiefs is enough to clinch them a spot in Saturday’s semifinals. Matthew Hudson scored the other goal for Ottawa (2-2-1), tying Sault Ste. Marie’s Matt Pinder for the tournament lead with his sixth. Kuffner finished with a goal and an assist. Chris Gerrie and Trey Degraaf had the goals for Red Deer (2-1-2), which is into the semifinals at the National Midget Championship for the seventh time in nine all-time appearances, dating back to their first trip in 1979. Hudson opened the scoring just 3:29 in, but Gerrie brought the Chiefs back to even just nine minutes later, wiring a shot to the short side over the shoulder of Hofley, sending the teams to the dressing room tied 1-1 after one. Red Deer took its first lead four minutes into the second period when Degraaf jumped all over a loose puck on the power play, jamming it past Hofley for the 2-1 goal, but Kuffner struck back on an Ottawa power play at 5:06 of the third, his shot from the point finding its way through Chiefs netminder Matt Zentner. Hofley was the story for the Jr. 67’s, particularly in the final 40 minutes when Red Deer held a 40-13 advantage in shots on goal. Zentner finished with 25 saves as the Chiefs outshot Ottawa 57-27. Both teams will wait for the results on Friday’s final two preliminary round games to find out when, and in Ottawa’s case, if, they will play in Saturday’s semifinals. Location/Lieu Sault Ste. Marie, Ont.